UPcoin is a cryptocurrency exchange offering 1000+ trading pairs 24 hours a day, 365 days a year. UPcoin’s exchange software is built around speed and safety. The exchange currently can handle 5 million transactions per second, which is quite impressive. To ensure investors funds are secure, UPcoin has employed “white-hat” hackers to test the security of the exchange. Also, 97% of customer funds will be kept in cold storage for extra security. Instant deposits and speedy withdrawals allow easy funding for investors. The Best Beginner Friendly Cryptocurrency Exchange? Cryptocurrency trading interfaces or “UI’s” used on altcoin exchanges can be confusing, UPcoin hired a team of professional UX (User Experience) designers to design the user interface. The user interface is easy to understand and perfect for new crypto investors. As for experienced traders, the interface is designed to be used effectively with ease. Numerous order types are available such as: limit order, market order, trailing stop, stop order, and stop limit. These can be used trading penny cryptocurrencies to help limit the risk. Lengthy response times are normal on most cryptocurrency exchanges. Most exchanges are under staffed and lose customers due to poor support. UPcoin aims to change that by having a support staff employed 24 hours a day. With a large support staff in place, UPcoin guarantees a response in 24 hours or less. UPcoin offers some of the lowest trading fees available to investors. All internal trades made on the exchange have a small fee of 0.2 – 0.1% total trade. UPcoin uses existing financial reserves, which allows lower fees to all traders. These fees will not increase with time, UPcoin plans to use these prices for no less than 10 years. 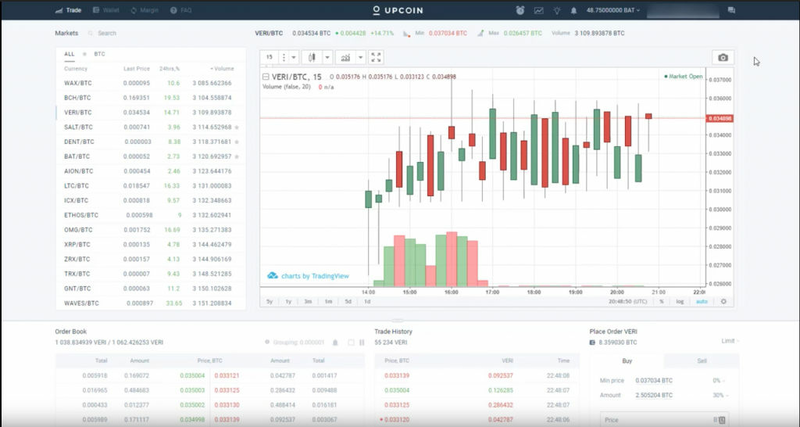 Ready To Trade Using The UPcoin Cryptocurrency Exchange? Currently UPcoin is allowing Coinformant.com readers early access to the exchange before the public launch in March 2018. Creating an account is free and UPcoin is offering a bonus package for early adopters.